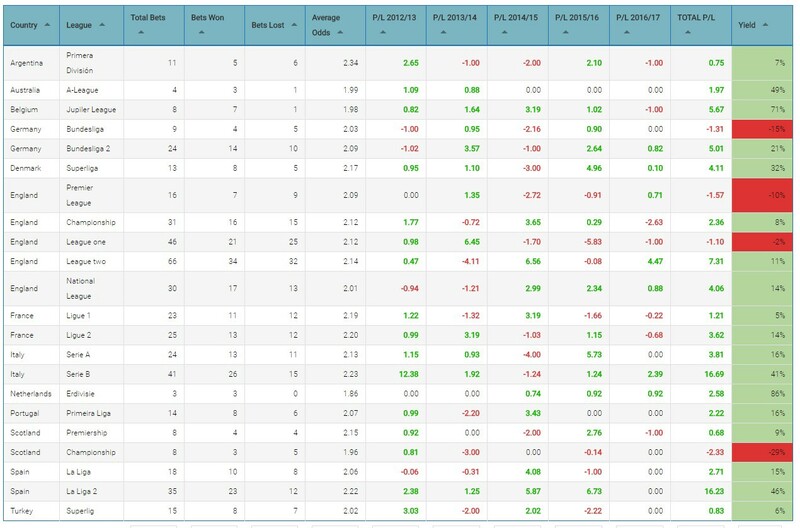 In this post, we are going to analyse a new betting system to bet against the trend, based upon the market “Over/Under 2.5 goals”. 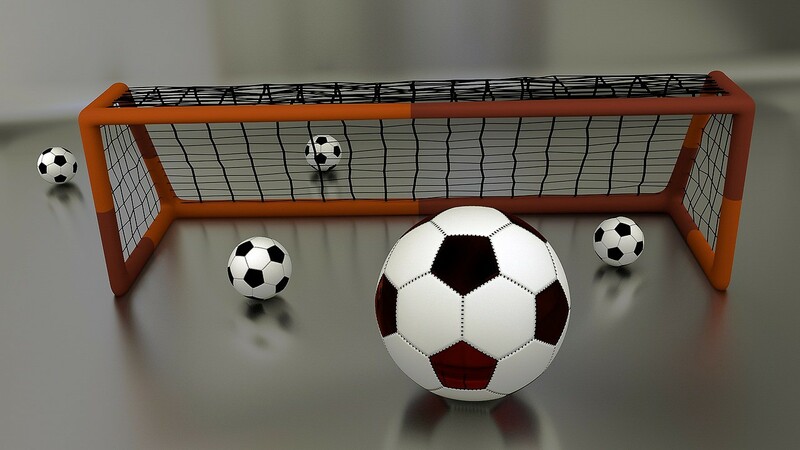 The average odds for the bet type “Over/Under 2.5 goals” for most games is even; that means, odds usually set around 2.00 (1/1) for each bet, without deducting the fee or commission for the bookmaker. Regarding the probability, that implies about 50% chance. Following this statement, we can think that after three games in a row finished under 2.5 goals, the odds estimated by the bookies that the fourth match ends over 2.5 goals, could be higher. The system wants to take advantage of those odds. The concept of this strategy is based on the break of that streak. We search teams where the last three football matches played overall finished under 2.5 goals (scored + conceded), and the opponent team with the same condition, the last three games ended under 2.5 goals too. 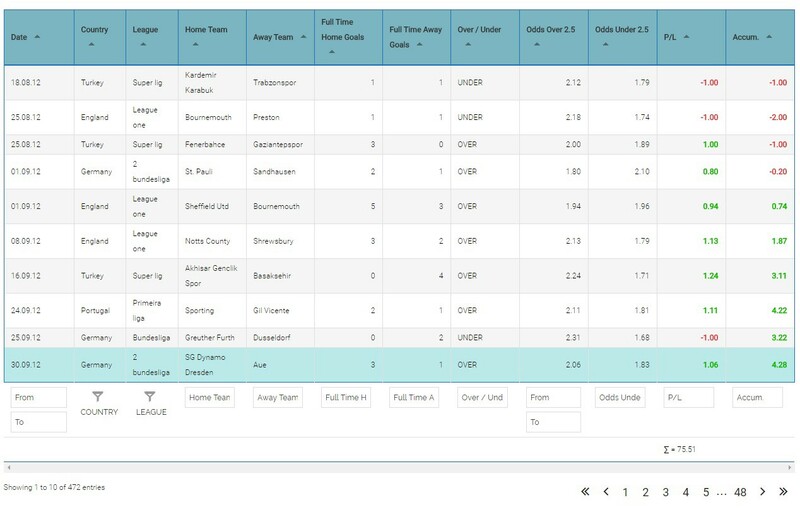 Therefore, the target of this betting system is to search games where both teams with the last three football matches played overall finished under 2.5 goals (scored + conceded). If that condition is fulfilled, we will place an Over 2.5 goals bet in the fourth match. We want to prove if that argument is strong enough to build a strategy, not considering other factors, such as line-ups or other variables, into account. As we did with the last strategy “Bet on the Underdog at home”, for this kind of system, we decided not to filter or remove any league from the results. Some competitions could be deleted from this strategy to make a higher profit, but we want to show you the results for all the leagues we have collected data. Odds for Over 2.5 goals. Odds must be included in the interval 1.70–2.40. Yield. The Yield obtained in the system: 16% after 472 bets matched in the strategy. The system obtains a positive result, a 16% yield after 472 bets during more than four years. As you can check, the system is profitable for most of the football leagues tested. Only four leagues have negative results for this study: Bundesliga, Premier League, England league one and the Scotland Championship. For this betting system, we obtain a 55 % ratio of winning bets. 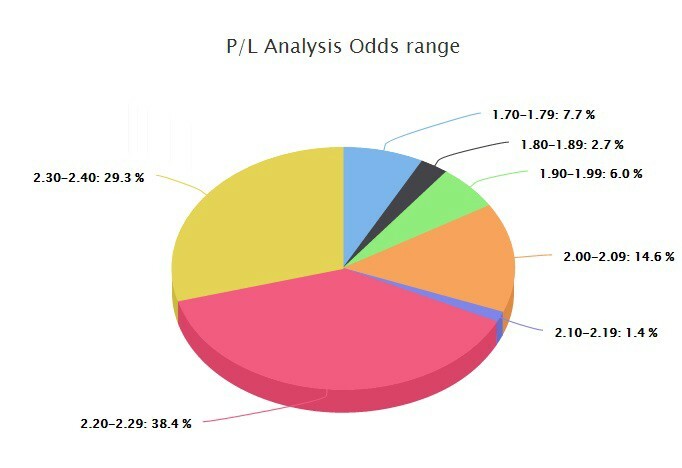 If we analyse the results by odds range, we can confirm that the system works for every interval, where the highest profit is made from 2.00 to 2.40, with 183 bets and a profit of +51.15, that means about 28% yield. Each interval has a consistent profit; that means that those odds fit for the strategy. If you look closely at the chart, you can realise the profits increase slowly, but gradually. Here, the system doesn’t have a long negative streak, so the drawdown for the period studied seems not hard to face. But we cannot assure it will continue that way in the future. Most of the betting systems suffer a negative streak; that’s something you have to get used to if you want to succeed in the world of the sports betting. To expand information, we want to comment two interesting Tweets received regarding The Underdog System. One Tweet from Joseph Buchdahl @12xpert. For those who might be unfamiliar with the p-value concept, here you can find a brief explanation: The P-value, or calculated probability, is the probability of finding the observed, or more extreme, results when the null hypothesis (H0) of a study question is true — the definition of ‘extreme’ depends on how the hypothesis is being tested. P is also described in terms of rejecting H0 when it is actually true, however, it is not a direct probability of this state. The P-value for that strategy was 0.035 (1-in-28), that means that if you have a silly monkey making bets for you with the same conditions, 1 of 28 times the monkey will succeed making a profit for you, or in other words, that stupid monkey has a probability of 3.5% of making a profit placing bets within that conditions, if the monkey is lucky. This is a moderate evidence indicating the system could not be a simple matter of luck. 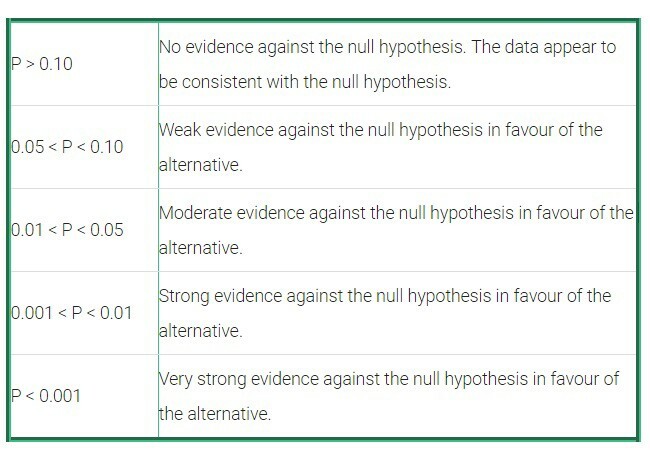 For the Over 2.5 Betting system, the P-value is under 0.01, and near to 0.001 (we would appreciate if someone could give us the exact p-value), wich means we have a strong or very strong evidence that the results for this systems are not a matter of only luck. We received another interesting Tweet from Thomas Loridan @teouchanalytics. Thanks Thomas for your Tweet. If any of you have a system in mind, but you don’t have the tools to test that strategy, please contact us via the contact form. Thanks, Joseph and Thomas for your valuable inputs on this subject. We will follow this system for the current season, the future games matched in the strategy will be published on the web and also on our Twitter account @betaminic. This article originally appeared on Betaminic.